A new softcover edition of the sold-out The Art of Japanese Monsters will be released October 13th. 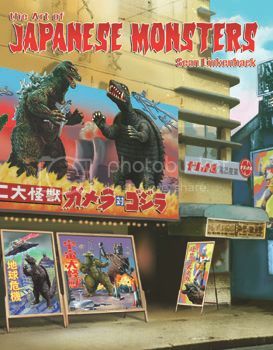 This reference guide to Japanese science fiction film posters from 1954 to present contains artwork from over 60 different films, including the Godzilla, Gamera, and Mothra series; RODAN, GAPPA, the Majin films, WAR OF THE GARGANTUAS, THE H-MAN, and many more. Does anyone know where someone could get this book? mbozzo wrote: Does anyone know where someone could get this book?